Where: Plaça Catalunya, in front of Café Zurich. Look for the guides with the WHITE umbrellas! 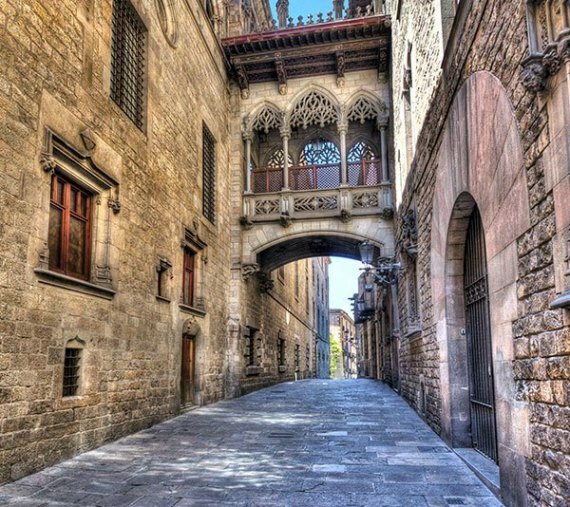 Come discover the rich history of Barcelona’s Gothic Quarter on this free Barcelona tour. This free tour of the Gothic Quarter is hosted by our partners at PlayTour Barcelona. Explore Barcelona’s Gothic Quarter with its winding streets and narrow alleys, filled with shops, bars, restaurants, and historic sights. Witness the city’s world renown liveliness and passion in this cultural labyrinth. Beauty and art are all over the city, but it all started in Barcelona’s Gothic Quarter. The Gothic Quarter, or Barri Gòtic in Catalan and Barrio Gótico in Spanish, is a vibrant neighborhood that truly makes Barcelona like no other city. It is the oldest part of the city with more than 2000 years of history, and is home to many historical sights. The Gothic Quarter Free Tour visits many important architectural structures and sights of historical and cultural significance. At Original Europe Tours, we pride ourselves in offering comprehensive, fun, informative, and quality tours. We are very happy to feature our partners at PlayTour and their popular Gothic Quarter Free Barcelona Tour. So come join us and PlayTour to make the most of your time in Barcelona! Our tour guides are local experts with a true passion for the history and culture of Barcelona. This is a FREE walking tour, so you decide the price! Tipping is encouraged because love doesn’t pay the bills but the amount is totally up to you! Our guides are always ready to give recommendations for the best food, tapas, drink, fun, and culture for the city they call home. Discover hidden gems in Barcelona’s Gothic Quarter. Explore Barcelona’s Gothic Quarter on a free tour! The Gothic Quarter Barcelona Free Tour is a 2.5-hour extensive tour on foot which covers Barcelona’s cultural melting pot. Come take a step back in time in Barcelona’s famous Gothic Quarter to relive medieval times or experience its vivacious atmosphere. Barcelona is the capital of Catalonia, an autonomous community in Spain with a historic national identity! The city is rich in the culture of Catalan triumphs and battles, arts, and innovations. Catalan history goes back to pre-Roman times leaving always something new to learn about Barcelona! As well as creating a complex and interesting dynamic of Catalan independence from Spain within the city. Learn more on the Gothic Quarter Barcelona Free Tour. Meeting Point: Plaça Catalunya, in front of Café Zurich. Look for the guides with the WHITE umbrellas! The exact route of the tour is susceptible to changes, depending on the guide, the group, and the weather to ensure the best possible experience for you!